Freedom Alliance arranged a bow elk hunt for soldiers of the Fort Carson Warrior Transition Battalion (WTB) in Colorado. However, due to the special needs of each soldier, what was supposed to be one hunt, turned into three. The first to venture into the Colorado mountain wilderness was Craig, who is soon to be deploying with his unit and therefore couldn’t participate in the event with the others. The elk hunt was his going-away gift from Freedom Alliance, and he was thrilled for the opportunity. Craig received a Purple Heart when he was injured in an explosion during his last tour of duty, causing him to need a complete hip replacement. Although he still walks with a limp, Craig wanted to deploy again, to be with his comrades in arms. With his field guide, Ryan, Craig camped on Badger Flats, near Colorado Springs. With only old signs of elk in the area, Craig and Ryan kept exploring for two days, getting very close to the animals, but always just missing them. Despite the lack of a trophy kill, Craig was nevertheless happy for the time away in the mountains that he loves. Nate was our next hunter. New to the WTB, new to hunting elk, and new to shooting with a bow, Nate was not new to the outdoors. Starting out as a military police officer in the Army, he served as a gunner during his deployment to Iraq. Due to an unexpected blast (in which his friend was blinded), he tore cartilage in his knee. He finished his tour, having been diagnosed with chronic knee pain. When it intensified upon returning home, a scan revealed the severity of the injury, which was caught in the nick of time. An avid fisherman, Nate holds the record for carp in the state. He has even volunteered to organize fishing trips for Freedom Alliance, to help other soldiers get outside while they rehabilitate. Nate had appointments that prevented him from attending the initial hunt we had scheduled, and so we contacted a local church with experienced hunters who agreed to take our soldier out independently. 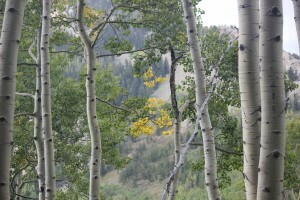 The hunt began in the Flat Top Wilderness Area, near Glenwood Springs. 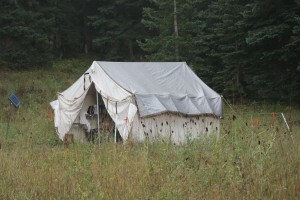 The campsite was set up before dark, and the next morning was spent hiking and searching for elk. Nate’s knee was aching, and so he and Ryan rode out to meet the other hunting party, from which they returned on horseback. Stopping at Turquoise Lake, Nate caught several trout, one of which the fellows kept for lunch. At one point, there was a crashing in the woods, and Nate glimpsed an antler rack of immense size, but there was never a clear shot. When the guide saw the tracks and heard what Nate had seen, he confirmed that this particular bull elk was legendary in the area. “I had the time of my life,” Nate said, even though he didn’t take an elk. He was more than happy to have seen one, also spending time in the mountains and—his favorite—catching fish. Brian, a machine gunner, was injured due to the nature of his job, for which he would carry an extra one-hundred pounds of gear, causing a lot of stress for his knees, especially when having to run or move quickly. A member of Fort Carson’s WTB, Brian hunted the West Elk Mountains with fellow soldier Ryan, who is recovering from a hip injury after several deployments. Sawbuck Outfitters, the donors of this hunt, provided horses for the troops. 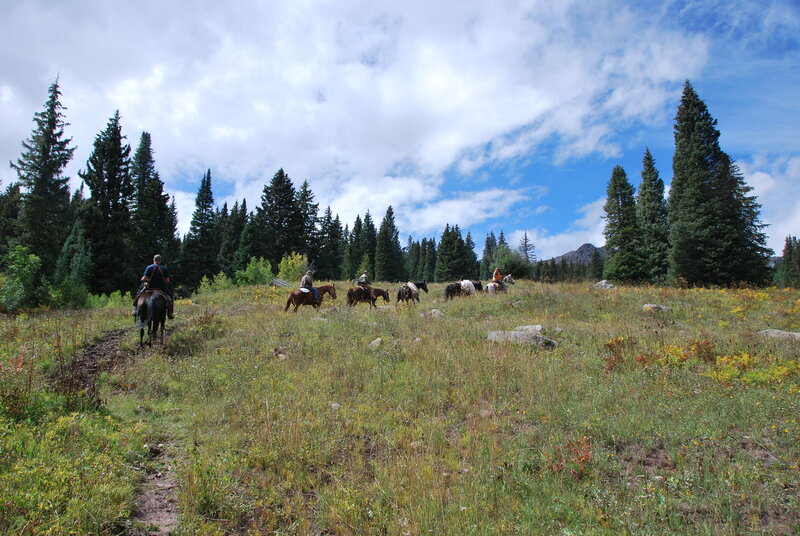 It was an early, early morning, but Brian, Ryan, and Dave (our volunteer guide) loaded up the horses with food and gear and rode two and a half hours to reach Gunnison National Forest. It rained during the ride, and so a good fire was the first priority once they reached camp. Their hunt ended early when an intense storm ran its course through the mountains, taking down trees and destroying the campsite. Prior to the abrupt ending, the guys were ecstatic to track and spot several elk, although they were not able to take a shot, due to distance and timing issues. “The hunt was more than awesome,” said Brian. Like the other service members, the lack of game didn’t put a damper on their spirits. These guys love the outdoors so much that we look forward to getting them back out for another try.